Yes, you can have it all! I'm in love with Soap & Glory Clean On Me shower gel. Cleanliness is essential when godliness is improbable'. This gorgeous creamy shower gel is a god send. Not only does it have mandarin peel extract it also has 'built-in body lotion' which leaves my skin as soft as silk, it also leaves a pleasant scent of creaminess on my skin. It's scented with their classic Original Pink fragrance which smells divine. Instead of just taking it to the shower with me to wash myself in scrummy goodness, I use this as a bubble bath too. I'm pretty sure it's not one of its purposes, but it really makes a gorgeous bath. I step out of the bath smelling good and feeling good. What's not to love? You get a lot of bang for your buck too, a huge 500ml bottle is an affordable £5.50. Perfect. What is your all time Soap & Glory product? Have you tried this? I'd love to hear what you have to say! Thanks for reading! Grab your self a bottle from your local Boots! 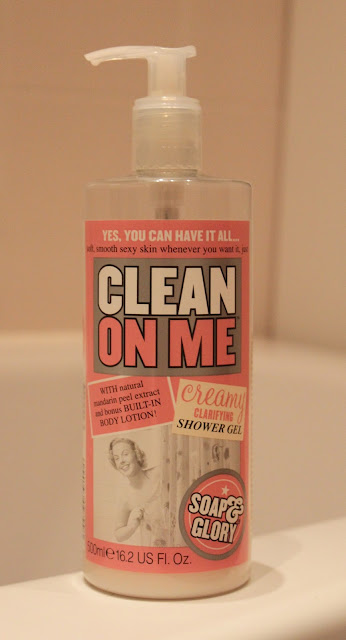 I always hear so many good things about soap and glory body products but i've never tried any! Next time i'm in boots i might get a gift set of them! Aw I really need to try something from S&G! I love this stuff too, Hannah! Apparently it smells like Miss Dior? I don't own that perfume, so I'm not sure. But it does leave the skin feeling so soft! Thanks for following my blog, I'm following yours! Oh no :( This scent to me is more subtle, but obviously give it a sniff before you buy it! That's such a shame. I know a friend who's like that too, she hates lush because it's too overpowering, but I love it!! I love this product, Soap & Glory never fail to impress me! I've never tried a soap and glory product but keep meaning too - i only ever hear great things about them! This and the sugar crush one are on my "have a smell" list for next time i'm in boots! This is a staple in my bathroom! The pump makes is last forever. I'm glad I managed to get the massive christmas set in the 75% off Boots sale so I am set for S&G for a good while! !